The bathroom is typically the room where individuals start and end their day, but it is often overlooked. Having an appealing and organized bathroom can enhance your life, and increase the resale value of your home. With so many choices, it can be tough to know where to start. What kind of space will you have available? If you have a small bathroom, then a wall unit might be the best way to provide storage without taking up too much room. 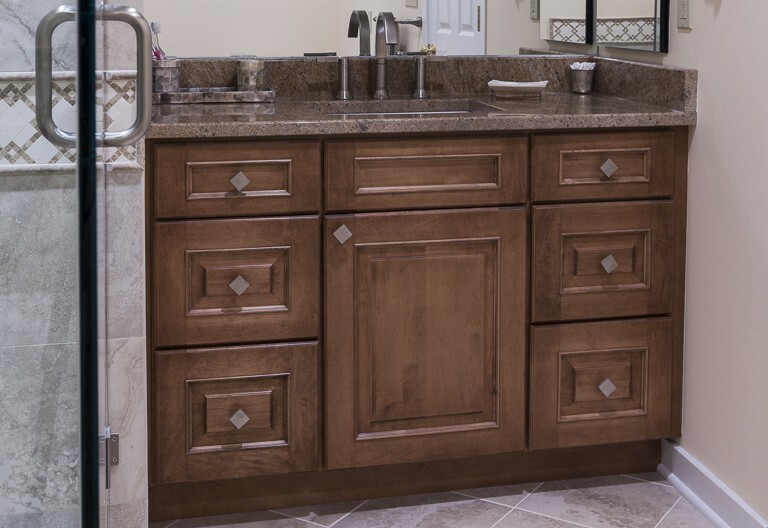 When you want to increase the usable space of a bathroom, taking cabinetry upward is a great idea. Tall storage solutions that stretch from the floor to the ceiling can give you all the space you need for toiletries and towels. Corner cabinets are a smart option that use space that wouldn’t otherwise be utilized. Bathroom vanities can include a large mirror, and they can be wall mounted for a sleek look. 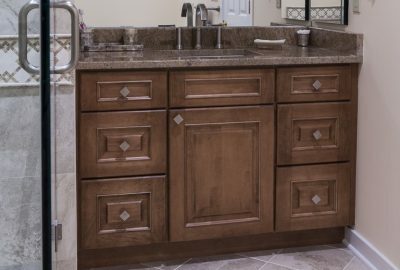 For a more traditional “old fashioned” appearance, consider freestanding cabinets in your bathroom. 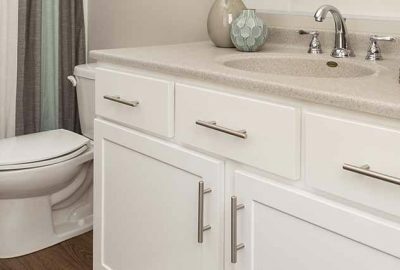 Although thinking about color and style is fun, the features an practicality of your bathroom vanities and cabinets are super important. In a master bathroom, you might need lots of shelf space for toiletries, or a large countertop above the cabinet for two people to use at once – more space for “permanent items”. 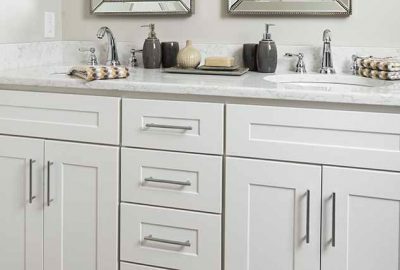 Alternatively, a guest bathroom may only need minimal storage space but an inviting style – more space for “temporary” items. Open shelves are a popular trend that brings color and style to the bathroom. 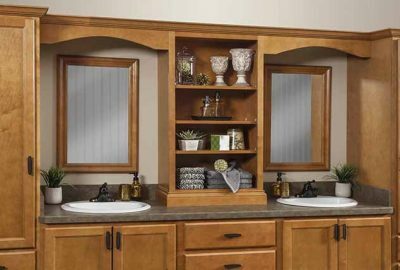 Instead of a standard medicine cabinet mirror, consider a vanity with built-in storage options or drawers for all your smaller items. 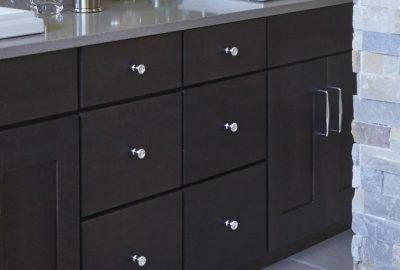 Even tilting drawer fronts offer a fantastic way to present towels or linens with modern style. Reflect your personal style or match the style already found throughout the house. If your home is whimsical, then adding brightly colored cabinets could be a fun touch in the bathroom. If you live in a contemporary home, then sleek and modern cabinets could be a better fit. In addition to choosing materials and styles, remember that you can branch out with stains and hardware as well. 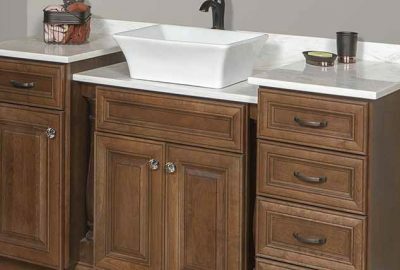 Even the pulls and knobs on cabinets can define the look of the bathroom, injecting some of your personality into the space. Exploring all your options ensures that you find the right styles at the right price, and that it all works well in your space.